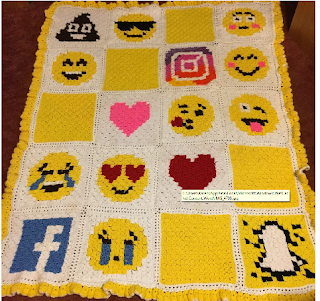 This is the entire emoji throw blanket. My photography skills are a work in progress! Thank you for looking at my work, hope you enjoyed seeing it. 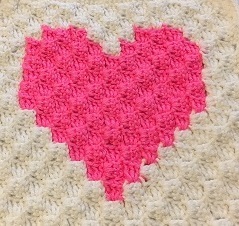 It's almost Valentines Day so crochet hearts are the order of the day! 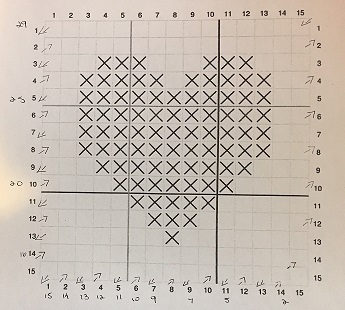 in the blanket I'm working on so I found this heart graph with written instructions. the written instructions for the heart. I have made several c2c blankets with stripes but struggled with following graphs. instructions were coming out backwards for me from row 13 to row 21. 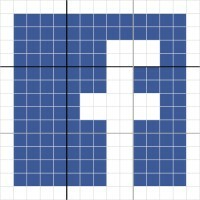 Even though this was frustrating it helped me learn how to properly read graphs. 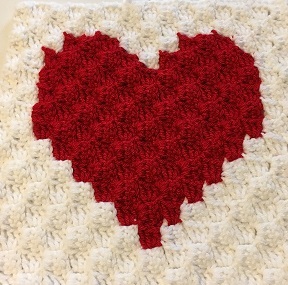 is helpful to my readers that want to make a lovely Valentine heart. The handwritten arrows show the direction that I was going for each written row. make a beautiful patriotic doily. I used this pattern for the smaller doily 10" Patriotic Doily . This was a paid pattern from Amazon (.99) and uses the Kindle app to access the pattern. This can be read on any device. This doily works up very quickly and I made each one in just a couple hours. There are so many patriotic doilies to choose from that make a perfect display for the summer holidays of Memorial Day, 4th of July and Labor Day. I finally was able to finish another pattern and publish it on Ravelry. 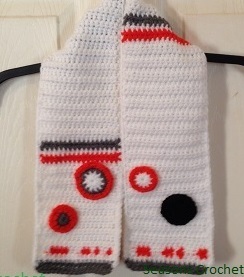 My grandson Max, age 6, is a fan of this little robot so I wanted to make him some accessories to wear. 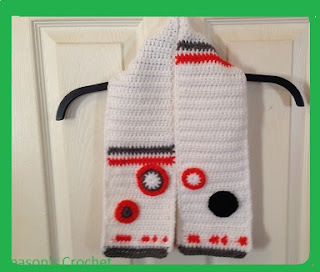 I found a pattern for a BB8 beanie on Ravelry but no scarf or gloves. This is the scarf. The little embellishments and eyes like the robot has on him make this a fun and colorful accessory for a small child. These are the fingerless gloves, or wristlets. These look like fun to wear and kids could even wear them over regular knit gloves. Here's some links to my patterns on Ravelry. I hope you enjoyed looking at my new pattern and that you enjoy making them for a Star War's fan. 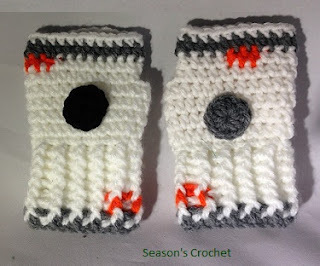 This pattern is for a beer cozy. 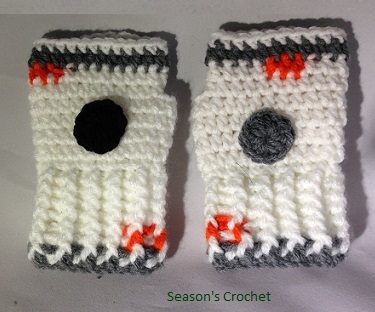 These cozies are very popular among beer drinkers! They are pretty and festive and keep the cold bottle from touching your hands. I'm not a beer drinker but I've had some requests for these from my family members! 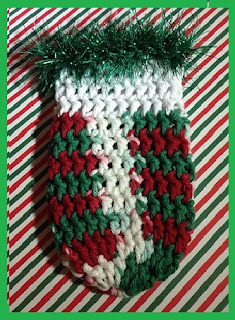 These cozies are very easy and quick to make. Row 1- ch4, join, ch 1 and 12 dc in circle. Use the magic circle if you like. You'll have something that looks like this. Rows 4-12- repeat row 3. Fasten off. At this point your cozy is finished except for the trim if you are choosing to add trim. Rows 13-14- sc in each dc around with the trim of your choice. I really like this trim. It's Yarn Bee haute fur wild- Golden Marmoset. This was easy to work with and looks cool. The yarn I used was I Love this Cotton in Taupe Ombre. I really do love this yarn, it's so soft and pretty. Sorry, I didn't have a beer bottle so this is a coffee flavoring bottle. This example uses the same trim but I tried adding some trim in the front loops of Row 2. I didn't really care for how this turned out. This trim is faux fur trim that I sewed into the top of row 12. This was hard to work with and although it looks ok I don't think the fur will stay nice looking. This is the trim I liked the best. This is Yarn Bee gilt Eyelash in Kelly green. This was easy to work with and looks good. The variegated yarn is Peaches and Cream in Yuletide. 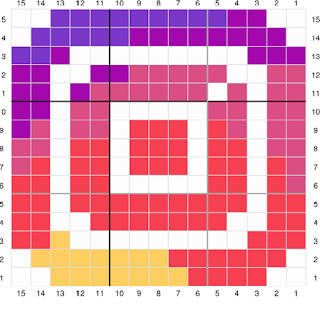 I'm sure experienced crocheters could figure this pattern out on their own but I hope this pattern will make it a little easier to make one of these. Even though the pattern is easy to figure out for yourself, having the hook size and the stitch count already tested makes it more fun to just sit down and accomplish something. I hope you enjoy making this cozy! This is my first written pattern. If you make a Poinsettia Tealight Cozy and have any questions, please let me know and I'll try to help you. 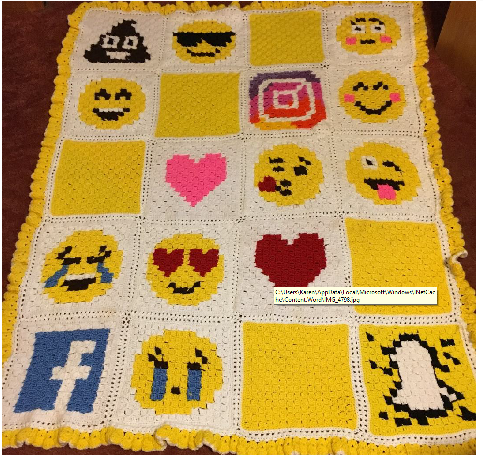 This pattern is free, if you make this cozy please credit me for the design. *to * in each loop around. Join with sl. Fasten off and weave in ends. sc between loops in Row 6. Continue * to * around. Fasten off. sc in Row 6, ch 10, sc around next sc in Row 2, ch 10. Join with sc in first sc. Fasten off. You have 4 loops evenly spaced below the 2 tiers of red petals. dc, 1 hdc, sc in sc from Row 8, continue * to * in all 4 loops. Join with sl st. Fasten off. 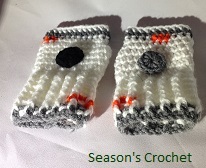 This pattern is the intellectual property of Season's Crochet and can not be reproduced or sold without permission. I'm making a couple Turkey hats, one for my grandson and one for my great nephew. I started out with a basic hat with earflaps. They are both in Kindergarten so I wanted the hats to be around 19 or 20 inches in circumference. I looked at Pinterest at a couple different Turkey hats and used them for ideas for the decorations on the hat. I added eyes, a nose and a wattle and 5 turkey feathers! Then I added some swirly pieces as hair for more decoration on the top. And last I added braids to the ear flaps. I'm still working on the 2nd hat. I hope you enjoyed seeing my turkey hats.